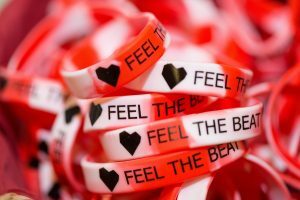 The fifth annual “Feel the Beat” event, hosted by the Todd and Karen Wanek Family Program for Hypoplastic Left Heart Syndrome (HLHS), will be held Saturday, Oct. 14 in Rochester, Minn. “Feel the Beat” brings together clinicians, researchers, advocates, and families affected by HLHS, a severe form of congenital heart disease. The one-day event showcases the latest research, highlights guest speakers, and brings together the congenital heart disease community. This year’s event will feature a patient and family-led panel focusing on inspiration, followed by a panel of physician collaborators from around the country discussing the transformation of HLHS research and care. The “Feel the Beat” event is open to everyone. Visit the "HLHS: Cause to Cure" blog for more information and to register. For any questions, please email the HLHS team.